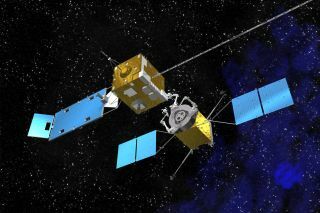 An artist's concept of a robotic unit transferring much-needed propellant to an orbiting satellite. Of the many daunting challenges involved in launching satellites into space, one of the most hazardous is handling the dangerous oxidizer that power spacecraft rocket engines during the journey in orbit. Toxic, corrosive, and highly compressed, the chemicals requires special handling and unique technologies to safely transfer it to fuel tanks before its journey. New NASA robotic tests are opening doors not only to safely handle spacecraft fueling on the ground, but also the potential to refuel satellites in space that were never intended to be serviced. A new NASA video shows the future of robotic refueling in space, and how the space agency hopes to extend spacecraft lifetimes. Following a successful 2013 demonstration of robotic fuel transfer operations on the International Space Station, the Satellite Servicing Capabilities Office (SSCO) at NASA's Goddard Space Center in Maryland has begun the next phase, the Remote Robotic Oxidizer Transfer Test (RROxiTT), which addresses more challenging aspects of in-space fuel depots. In January 2013, the Robotic Refueling Mission demonstrated that a remotely controlled robot could work through the wires and caps on a satellite fuel valve to transfer fluid into orbiting spacecraft that had not been designed for refueling. On the space station, ethanol was substituted for the hazardous satellite fuel. Extremely corrosive, oxidizers such as nitrogen tetroxide are chemicals that that mix with satellite fuel to cause instant combustion. The toxic materials are kept at intense pressures of up to 300 pounds per square inch, approximately 20 times atmospheric pressure. Current transfers of the material to satellites before launch requires a complex system between tanks. The RROxiTT industrial robot performs a test to refuel satellites on the ground, while controlled from halfway across the country. Here, the robot is based at NASA's Kennedy Space Center in Florida, but controlled from the agency's Goddard Space Flight Center in Maryland. The SSCO team approached the Kennedy Space Center in Florida to help with the testing. As part of the process, the two teams work together on remote robotic manipulation. At a console in Maryland, Alex Janas directed the robot through the stages of loading oxidizer into a simulated satellite 800 miles away at the Kennedy Space Center in Florida. From his desk, Janas could not observe the robot, tool, or propellant pump. Instead, he utilized cameras on the robot to mate the robot's tool to the satellite valve in order to transfer the oxidizer. "Conducting the test remotely adds an extra layer of complexity which helps us," Janas said. "It mimics what we would encounter during real robotic servicing in space, where the human robotic operator would be on the ground, far away from the client that his or her robot is servicing." From his control center at NASA Goddard, RROxiTT lead roboticist Alex Janas commands an industrial robot more than 800 miles away at Kennedy Space Center (robot shown here, right, at NASA Goddard before it was shipped to Kennedy). The team at Kennedy Space Center boasts hundreds of spacecraft launches under their belts. Working as part of the SSCO team, they designed, developed, and tested a unique, flight-like Propellant Transfer System to deliver the oxidizer to satellites. At the same time, the Goddard segment built a specially designed Oxidizer Nozzle Tool to connect to the RROxiTT test robot. The entire system can deliver oxidizer into satellites that were never designed for maintenance, extending the lifetime of existing systems. Nor is the system limited to space. Robots could serve to make ground transfers safer, allowing a machine to replace humans during the initial hazardous fueling of the satellite, controlled from a safe distance. Other parts of the technology developed by the SSCO can be applied to human exploration, observatory servicing, the assembly of large space structures in orbit, and perhaps even planetary defenses. "NASA is constantly inventing, testing, and refining cutting-edge technologies—always with the goal of expanding our reach into space and eventually transporting humans to Mars," Frank Cepollina, associate director of SSCO, said. "We're excited to be pushing the next evolution of technologies in this field. It's a great time to be part of NASA."